There's a lot of Lego worship going on in the Lin household. And we've done some pretty cool things with them here on this blog. We've experienced the thrill of completion and the agony of subsequent gravity. 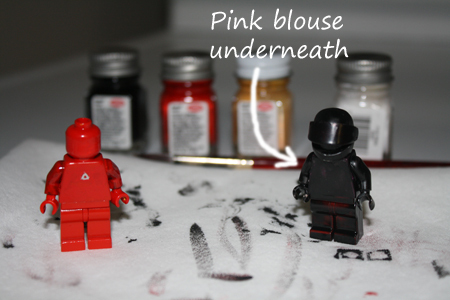 We've used the Lego Minifigure to replicate bloggers and perpetuate cultural stereotypes (flashing my rice paddy pass). We've played bartender and even nightclub mogul with them. But this past weekend, we achieved the epic. We colored outside the lines. We went rogue. We went to Michael's. And bought paints. Paints that I hadn't seen in at least 25 years. Remember when you could go to any drugstore and buy model kit Camaros and F-15s? And you had to glue them together and paint them yourself with those cool little bottles of Tester's model paints? They still exist!! Step 1: find two Lego minifigures you're willing to sacrifice for the greater good. In other words, not the Star Wars ones! Give them a good base coat. 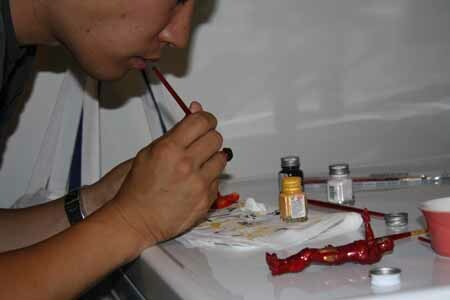 Step 2: let them dry overnight, then apply your outlines. Step 3: use child labor to fill in those outlines. Step 4: finish the job once child becomes bored. Step 5: revel in your awesomeness. 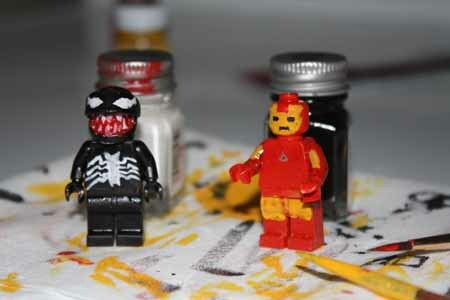 The unofficial offical Venom and Iron Man minifiguresStep 6: Introduce your child to the wonders of stop motion animation.